Only $ 595 per month rent! BRING YOUR BUSINESS TO THE ISLAND! 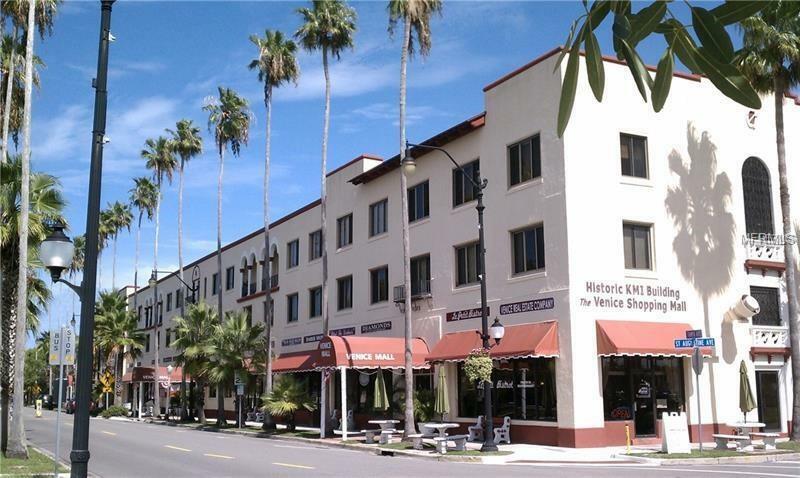 Great office/retail/commercial space available on the Island of Venice in the historic Venice Centre Mall, a/k/a KMI Building. This Building is on the National Register of Historic Places, formerly the Kentucky Military Institute, now the Venice Centre Mall. Located on the first floor, join 20 commercial office/retail/restaurant spaces, all fully occupied. Large private parking in the rear of the building, and plenty of FREE open parking across the street in Centennial Park for your customers. This commercial unit is part of a condo association that includes amenities such as restrooms, private parking, outdoor terrace, three main building entrances, and an air-conditioned Mall lobby. The complex even has a clubhouse & pool, terrific for office parties, general meetings, hosting seminars, etc. This space can accommodate two offices, a storage/kitchen area, in addition to a small lobby. Or use it as one large open-concept office space. Treat your clients to lunch in the building or walk across the parking lot to one of the many fine restaurants on Venice Avenue. Enjoy concerts in the Park after hours or catch a show at the Venice Theatre on the next block. Bring your business to the Island today and enjoy all the many fine aspects of being a part of downtown Venice's strong MainStreet community. Owner financing available! Listing provided courtesy of West Coast Realty Of Venice.